It's the perfect tool for your EdTech toolbox. Get free video conferencing for the classroom from FreeConferenceCall.com and make every lesson stick. What Can You Do with Classroom Video Conferencing? Great technology can engage students — but it's all about how you use it. Fortunately, video conferencing in the classroom doesn't have to be complicated. With our free EdTech tool, teachers can easily video conference, record and share. Use Chromebooks™ to host or join without downloads. So what can't you do with classroom video conferencing? FreeConferenceCall.com can make amazing field trips happen, minus the permission slips. 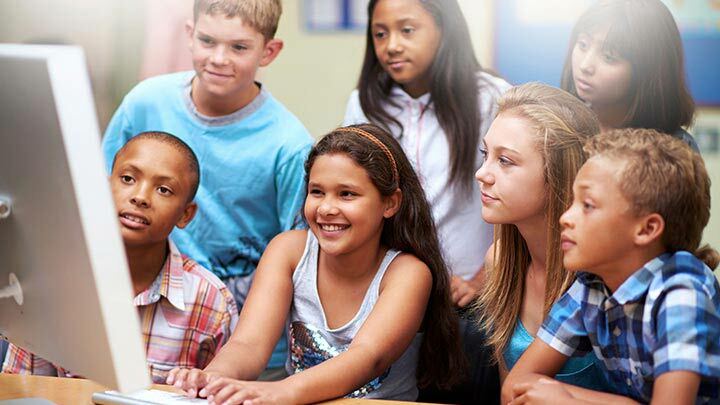 Engage with the world using video conferencing — or let students create and share presentations with other connected classrooms. Sometimes, students miss class. Sometimes, so do you. Free recording software from FreeConferenceCall.com is the perfect workaround. Recordings are easily stored and shared from your online account. Avoid scheduling conflicts on back-to-school night by meeting family members remotely. Teachers and family members can connect without downloads for a face-to-face parent-teacher conference. Watch this quck video to get an overview of FreeConferenceCall.com's innovative EdTech tool — then start enhancing education with free video conferencing and free screen sharing, all without downloads. Think out of the box to create authentic, real-world situations for your students. If you don't know where to start, try engaging your students in the planning process. "The future of education is expanding beyond the four walls of the classroom. With a free collaboration tool like FreeConferenceCall.com, I can provide ample opportunities for students to virtually learn from experts outside my classroom." FreeConferenceCall.com has a conferencing solution for any classroom — including conferencing for higher education. Use Chromebooks™ to host or join using any device without a single download!